The Applestone Meat Company wants to take the middleman out of buying meat. The sustainability-focused meat operation in Accord, New York is rolling out vending machines loaded with fresh, local meat. The carnivore-friendly vending machines are stocked with 240 items, including favorites like burgers, hot dogs, sausages, and what the company calls “some strange and wonderful meatballs,” sourced from antibiotic-free farms in the Hudson Valley, New York. There are also steaks and pet food, according to Modern Farmer. 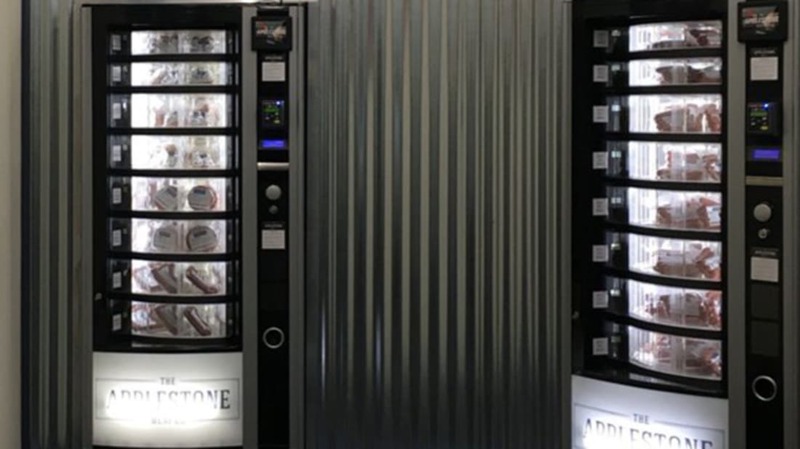 The vending machines are open 24 hours a day, take credit cards, and featuring varying selections depending on availability or even the weather. (Rain means more stew meat, for instance.) The plan is to expand the automated operation, adding two more machines to the Accord store, four more at their store in Stone Ridge, New York, and four or more elsewhere. You can already get pizza and burritos (not to mention short stories) from automated machines, so why not a steak? We’ll take one for the office, please.